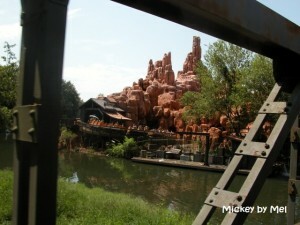 Tucked away in the far corner of Frontierland is one of the most popular rides at the Magic Kingdom. Part of the so-called, “Disney mountain range” – Big Thunder Mountain Railroad has been delighting guests since it opened in 1980. On Big Thunder Mountain Railroad guests board mine trains that take them through the gold rush town of Tumbleweed. Of course things aren’t always as they seem and little do the prospectors know that their mine town was built on cursed ground. A flash flood washed scared away all of the prospectors but the mine trains still run, and if you are brave enough you can board one of these possessed mine trains and take a ride through Tumbleweed! 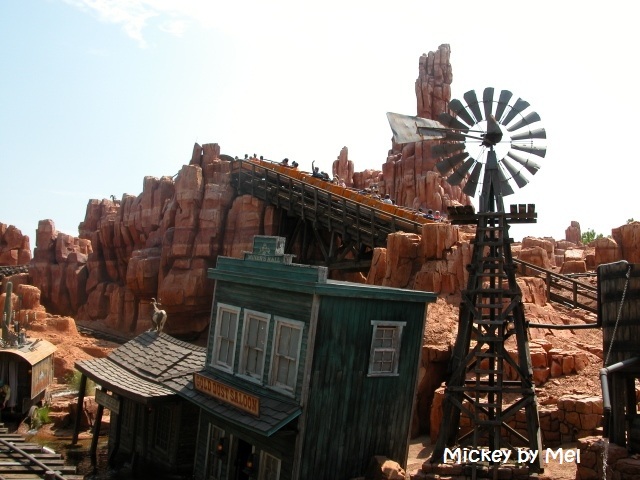 “Hang onto your hat, cause this here’s the wildest ride in the wilderness.” This is what passengers on Big Thunder Mountain will hear as they board their mine car. While this ride is classified as a roller coaster it is a family friendly ride without the huge drops of Splash Mountain, the crazy inversions of Rock N Roller Coaster, or the fearsome Yeti of Expedition Everest. There are definitely some ups and downs as you travel through the caverns, valleys, and mountains and you will get some of the roller coaster enthusiasts “air time” as you travel over the hills. Disney classifies this ride as a “family thrill ride”. Children must be at least 40” to ride. 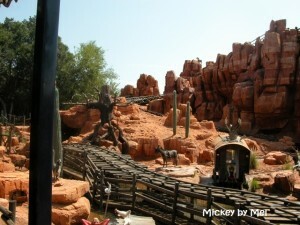 The Magic Kingdom was the second park to get a version of Big Thunder Mountain Railroad – Disneyland’s Big Thunder Mountain Railroad opened a year prior to the one in Magic Kingdom. Tokyo Disneyland got its own version in 1987 and finally Disneyland Paris opened in 1992. The Tokyo and Paris versions are simply Big Thunder Mountain. While each of these versions of the ride have slightly different nuances, if you have enjoyed the ride at one of the parks – you will most likely enjoy the other versions as well. It is always interesting to see how Disney has slightly changed things from park to park and see if you can pick out the differences. I would love to hear the differences in this ride between the parks if anyone has any first hand experiences! The abandoned minetown of Tumbleweed still stands. The lines for this popular ride can get extremely long (although usually shorter than its neighbor, Splash Mountain). You can always opt for a FastPass and then take the raft over to Tom Sawyer Island while you wait. 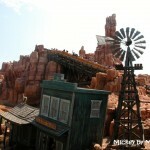 Or you can head right down the path and grab a bite to eat at Pecos Bill Tall Tale Inn and Café. Every rider is different, some riders who don’t enjoy roller coasters love Big Thunder Mountain Railroad while others still find it to be too much roller coaster. There is a path that winds slightly behind the ride (head toward the ride exit) that will allow you to see more of the ride if you are unsure if you would like to ride. For my family, this is a must-do on every trip for us. When my son was 2 he rode it for the first time and didn’t want to get off. Since that first ride for him he has ridden it at least once per visit since. My daughter, on the other hand, is 2 years older and just started riding it last fall (at age 7). Although since the whole family now enjoys the ride it is usually requested multiple times (especially after dark)! My single piece of advice is although this is a relatively mild thrill ride, do not coerce anyone into riding who is not comfortable with it, that is a surefire way to make everyone miserable.